Astigmatism is often misunderstood. Astigmatism is a refractive error, like short and long-sightedness. This means that it is not an eye disease or a health problem per se, but rather an issue with how light is focused within the eye. Eyes with astigmatism fail to gather light into a single focal point on the retina, which is essential for a clear line of vision. Instead, the light is scattered over numerous points of focus creating a blurred image on the retina. The blurred image is limited by 2 principal meridians, which can lie either in front of, or behind, the retina. A typical sign of astigmatism is that vision is blurry, or distorted, both near and far, though it may not be to the same degree. Other symptoms of uncorrected astigmatism include headaches, eye strain and squinting. However, accurate diagnosis of astigmatism can be complicated and it’s important that you visit an optometrist to have your eyes tested, you should never self diagnose. A cornea with an oval shape is typically what causes astigmatism. Instead of having a round and symmetrical shape, its shape is more like that of a football. One meridian is significantly more curved than the one that is perpendicular to it. The flattest and steepest meridians found in an eye with astigmatism are known as the principal meridians. In some cases, astigmatism is caused by the lens shape inside of the eye. This is known as a lenticular astigmatism, as opposed to the more common corneal astigmatism. There are 3 specific forms of astigmatism: 1. Hyperopic Astigmatism – either one or both the meridians are farsighted. 2. Myopic Astigmatism – either of the principal meridians are nearsighted. 3. Mixed Astigmatism – one principal meridian is farsighted while the other is nearsighted. Astigmatism can also be classified as either Regular or Irregular. Regular astigmatism is present when the principal meridians are at right angles to each other. Regular astigmatism is by far the more common and is easy to correct with prescription lenses. It is often described as a ‘football-shaped’ eye. Irregular astigmatism is characterised by meridians that are not perpendicular and is often the result of a surgery, disease or an injury to the eye, which causes the cornea to scar, distort or slowly thin out . Astigmatism is usually detected during a regular eye exam with the same techniques and instruments that are used for detecting long and short-sightedness. Your optometrist can estimate the amount of astigmatism present by using a retinoscope. This procedure involves introducing different lenses in front of the eye while shining light in at the same time. By observing how the light behaves when reflected in the patient’s pupil with different lenses, astigmatism can be diagnosed and measured. Many optometrists supplement, or replace, the retinoscope with instruments that are automated and provide a quicker way to test. However, whichever test is done, the optometrist will refine any preliminary findings with a detailed manual test method called refraction before giving you a lens prescription. 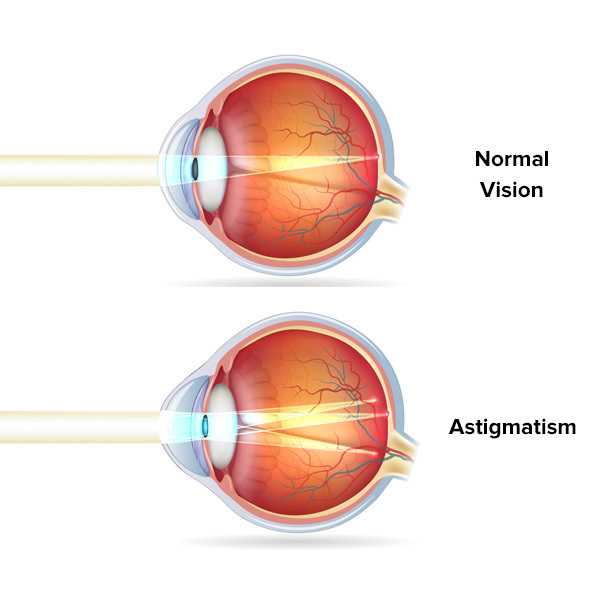 Astigmatism can generally be fixed by wearing glasses, contacts or sometimes by undergoing refractive surgery. In addition to the power of the spherical lens that is used to correct near and farsightedness in glasses and contact lens prescriptions, a cylinder lens power is needed to correct astigmatism. This is supplemented by a number indicating the direction, or axis, of the astigmatism. The axis of astigmatism gives the location of the flattest principal meridian using the 180 degree rotary scale. If you choose to wear soft toric lenses to correct astigmatism, your prescription will include all of the above. Contact lenses that are gas permeable can also correct your astigmatism. Since these lenses optically replace the cornea and are rigid on the refractive surface, the cylinder power may not be needed at all. This will depend on the severity and kind of astigmatism that is present.